A video made in 1994 by Don Norman about affordances. It’s interesting to see it explained by in a nice simple way. I’ve given this talk a few times now. It started with an introduction to physical sketching for a workshop on stylistic interaction at the Tweak festival in Limerick, and then has been modified slightly for presentation to MA students in SARC. This is the most recent version, and contains a short exercise at the end for using physical sketching in the explorative design stage of a novel musical instrument. The talk is based upon Bill Buxton’s book “Sketching User Experiences”. The BeatBearing is used as a design example, to help illustrate the difference between sketching and prototyping in the design process. Here’s a list of the books that I have read recently whilst researching for an essay (or perhaps thesis chapter?) on the theory of both design and interaction design. The books are listed below in the same order as they are stacked in the photo above. 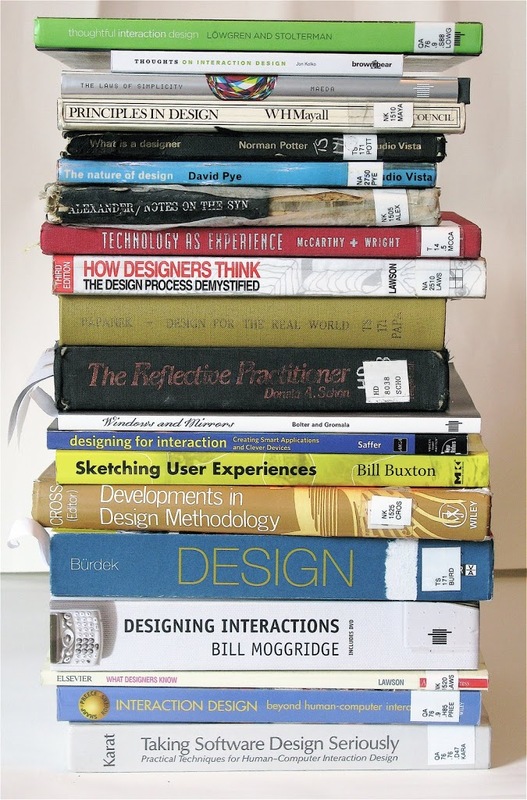 Although I won’t claim that this list is in any way comprehensive, I feel that there is a good range of books here for anyone interested in researching design, and interaction design. “Thoughtful Interaction Design: A Design Perspective on Information Technology” By Jonas Löwgren, Erik Stolterman. I recommend this to anyone interested in interaction design. This book is both readable and thought-provoking. “Thoughts on Interaction Design” By Jon Kolko. This book gives a great overview of what it means to be an interaction designer without delving into the theory. “The Laws of Simplicity” By John Maeda. This book should be a compulsory read for all interaction designers. “Notes on the synthesis of form” By Christopher Alexander. A design classic. “Sketching User Experiences: Getting the Design Right and the Right Design” By Bill Buxton. This book helps to clarify amongst other things the difference between a prototype and a sketch. Very useful, and a good read. “Designing Interactions” By Bill Moggridge. This seems to be the place to start as an introduction to interaction design, particularly for the history of the field.